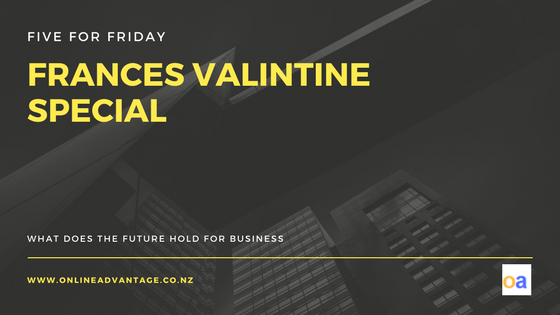 This week the Online Advantage team had the pleasure of listening to a talk given by Frances Valintine, an Education Futurist & the founder of The Mind Lab by Unitec & Tech Futures Lab. Frances sits on the board of Callaghan Innovation, KEA, and Talentnomics (WashingtonDC). She was previously on the boards of Education New Zealand, NZTech & the New Zealand Game Developers Association, Santa Fe University of Art & Design, Auckland Screen & Digital Content & a member of the Small Business Development Group. Payments methods are changing, and fast. The fastest change has been seen in China, where this year only 7% of transactions were cash & only 12% of online payments were credit card transactions. Chinese consumers are increasingly using apps like WeChat, and platforms such as Alipay and Tenpay to pay utility bills, get a loan, insurance etc. Since 2009, India has been collecting the biometric information (fingerprints and eye scans) of its citizens in a bid to issue biometric ID cards to its 1.3 billion residents. Plus, in November last year, India started a huge demonetisation process, invalidating all ₹500 and ₹1,000 banknotes overnight. With biometrics “you don’t need a phone, you don’t need a card, you are the money” (http://bit.ly/2j53YKD). We would recommend keeping up to play with new payment methods as they become available in NZ, especially if you are providing goods/service to China and/or Chinese tourists. Micro-payments. Thanks to ‘Blockchain’ – a peer-to-peer distributed database that can record any kind of financial (and non-financial) transaction – micropayments are predicted to be one of the biggest areas of FinTech growth in the next few years. Micropayments are very small payments made online in real time. As an example, UK insurance provider Lemonade utilises the Blockchain to operate cheaply and efficiently and, reportedly, once paid out a claim for a stolen jacket in three seconds. The BBC are considering using micropayments by offering articles for a few cents each. Micropayments are used regularly in China as well, for example you can use the WeChat app to insure your liver before you go out drinking! In 2016 Google announced that 20% of all Mobile Search was by voice and the ratio of voice search is growing faster than type search. In fact Google voice is now available to over one billion people worldwide and supports 119 languages. This is important to know because people don’t search the same way with their vocal chords as they do with keyboards; they use natural-sounding phrases & questions. This means we need to re-think website content & understand customer’s conversational speech & what they need in that moment. Google calls these needs micro-moments and divides them into 4 types: I want to know moments; I want to go moments; I want to do moments; I want to buy moments. It is important to research the questions your customers are asking, and offer quick answers and immediate solutions. Voice searches are also more location-focused than typed queries. This means that setting up your site correctly for local search is crucial, especially if you run a local business. Carrying on the voice-controlled theme. This year, 35.6 million Americans will use a voice-activated device at least once per month – this is not counting voice assistants on smartphones, but only those digital assistants on standalone voice-enabled speakers. At the moment it is Amazon’s Echo line of devices that are dominating the market. These devices act as a vessel for Alexa, the voice-activated software persona that Amazon has developed to allow users to control lights, take notes or pick out a song from Spotify just by using their voice. Alexa’s has now passed 15,000 skills – and has gone from completing simple tasks to being able to book tables at restaurants, buy tickets online etc. It is predicted that by the end if 2018 every home in the US will have one of these devices – watch this space NZ. Chatbots. A chatbot ‘is a computer program, powered by rules and sometimes artificial intelligence, that you interact with via a chat interface. The service can live in any major chat product e.g. Facebook Messenger. You will notice more chatbots popping up on service provider websites – instead of ringing a company you can now have a conversation with their bot who will use its own intelligence to decipher your query and come up with answers. In the US Starbucks has introduced a chatbot barista & Taco Bell have introduced the TacoBot (https://www.tacobell.com/feed/tacobot) . Air New Zealand are a local example – their new chatbot ‘Oscar’ will initially assist customers with commonly asked queries, offering a more personalised experience than searching a traditional FAQ page. As with other AI technology, Oscar will learn based on the conversations people have with him, becoming more user friendly and more helpful the more he interacts (https://www.airnewzealand.co.nz/press-release-2017-oscar-airnz-chatbot). These are just some of the topics Frances touched on, and are all relevant to how run our businesses now and in the future. We definitely recommend further research into payment methods and AI for business moving forward.